If you’re like me, you’re always looking for affordable and fun ways to promote your micro business or nonprofit organization. (A micro business is a small business that has ten or fewer employees.) One promotion technique is presenting your business or nonprofit organization at a local fair or festival. 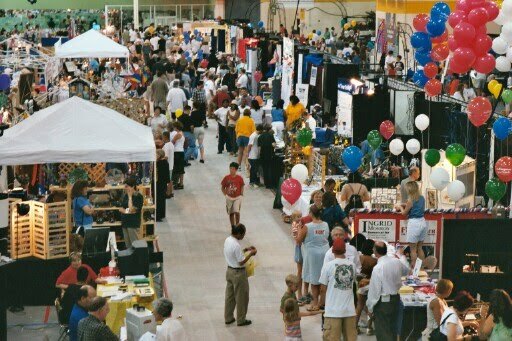 This can be an affordable way to show off your business to thousands of people in your community. The advantages of this tactic are that it’s affordable, it makes your business look like a good community participant, and a lot of people may see your business logo as they walk by. You can provide demonstrations or offer samples of your products, or even sell a few items, if it makes sense for your business. And if you manage a nonprofit organization, you can take advantage of the discount offered by many festival and fair organizers to raise awareness about your cause. A real disadvantage, however, is that it can be hard to connect with customers in a meaningful way at a bustling fair. There are associated costs. And staffing a booth for an entire day or weekend is fatiguing, and may feel like a waste of time if no one appears interested in your message. If you have reasonable expectations about the outcomes, however, you may wish to try it. Get your company name and logo in front of lots of people? Position your company as local and supportive? Show how a new service or product will solve a common problem? Get more fans for your Facebook Page? Collect email addresses? Inform visitors about an issue or resource? Arlington County holds their annual fair this week. The fair booths ($450) are sold out, but you can always ask about cancellations. The City of Falls Church is hosting a Fall Festival on September 11, and you can rent a 10 x 10 outdoor display space ($125). The Arlington County Fair attracts 50,000 attendees each year and the Falls Church Fall Festival reaches 5,000 attendees. At a busy fair, how do you get people to stop by your booth? The trick is to create a visually irresistible booth with a compelling marketing message that strikes a chord with the attendees. Plan for a simple but coordinated booth design that is easy to put up and take down. The most common space allotment is 10 x 10. If your booth is outdoors, you can get a 10 x 10 tent (also known as a canopy) for the space that will stand up to sun, wind, and rain. Get a good quality, stable tent (check out the well-reviewed First-Up Tent) for about $80 (Wal-Mart.com). Purchase tent weights to anchor all four legs ($10); and tent spray (about $3) to waterproof the tent, as well as optional side walls ($39). You will also want 2-3 folding tables ($29 each at Target) and 2-4 folding chairs ($10 each at Ikea). High-impact, easy-to-read signage for your booth is essential. Have your banner designed with your logo and five to seven words, maximum, perhaps highlighting one important benefit of your business. Or choose a great image, or suite of images, to attract visitors. Custom-printed vinyl banners are durable, affordable, and re-usable. Cover your display tables with bright fabric tablecloths and runners in your brand colors. If you can’t find them, you can buy solid color cotton twin sheets that look fine as table cloths ($4.50 at Ikea). Bring attention to table items with signs in small frames (Michael’s, Ikea). Draw people in with bowls of candy, samples, even cups of cold lemonade. Put out business cards in plastic business holders (about$2, Staples). You’ll want plenty of brochures. If you don’t have a lot of brochures to give away, give them to people who ask for them, or to people with whom you personally connect. Display a guest book or clip board to sign people up for your email newsletter list, with plenty of pens. Reserve space on a table for a flat lying photo album ($10 Michaels, $15 Target) showing examples of your work, photos of your business, and testimonials from clients. Large plants are a nice touch for booth displays ($10-$20, Home Depot). What about SWAG? Should you give away promotional items? I am not a fan. So many of these items are expensive and get tossed. I don’t think they do that much for your brand, or generate real leads. I would think of other ways to attract people to your booth, e.g., with samples, or a giveaway (e.g., a drawing for a showy gift basket), or with attention-getting demonstrations. Contact the organizers. Ask where your booth will be located, or in what general area. Ask for their advice about how to make the most of your booth. Be sure to inform the presenters in advance if you are planning giveaways or contests — there may be restrictions. Crafts artists are really good at creating attractive booth displays in 10 x 10 spaces on a a budget. Check out some of their display photos online for ideas. Plan what you will wear. Dress casually but coordinate to present a professional look. Have everyone in your booth wear a similar, casual outfit. For example, everyone wears black jeans and a t-shirt with a logo on it (you can order these from VistaPrint.com or Zazzle.com), or everyone wears khaki pants and a polo shirt emblazoned with your company logo. Promote your attendance to your Facebook Page friends and invite them to visit your booth. Call or email your local community newspaper and let them know your business will have a booth and its location (if you know it). They usually have a booth at these festivals, and they may drop by and take your photograph for the newspaper! Arrange your booth for optimal traffic flow, in and out. Don’t put your table across the entrance like a receptionist desk. Put the tables to the side. As soon as you have your booth ready, take a photo of it (and video, if you have a video camera). If you are the only person staffing the booth that day, ask someone to take a photo of you with your booth. You’ll want this image for your Facebook Page, blog, newsletter, etc. Smile and make eye-contact with passers-by! This is tiring work, though, so be sure to take breaks. Experienced trade show professionals have learned that if you sit down, and then stand up when a visitor stops by your booth, the visitor tends to get scared away. So, if you get busy, elect to stand (take turns so you can have a break) or sit on a high stool. Leave your lap top computer at home. Thieves target booths at festivals and trade shows to steal lap tops! Don’t be tempted to circulate in the crowd passing out items or flyers, or stand near another merchant’s booth to distribute materials. Usually, it’s forbidden by fair regulations, and it will annoy the other booth owners. You’ll be expected to staff your booth at all times while the festival is open, even if it rains. Posted on August 16, 2010, in Nonprofit Marketing Tips, Public Relations Tips, small business marketing tips, Trade Show Tactics and tagged fair and festival promotions for small businesses, Fletcher Prince, Mary Fletcher Jones, Small business, small business marketing. Bookmark the permalink. 2 Comments. This is one way of showing what you are best at. Often this is the beggining of your success.